If a blog resides in the blogosphere, can a pond be called the frogosphere? St. Louis Rams today. Thanks to Philadelphia, they have a shot at the top seed, although, in order for that to happen, Dallas needs to lose one game and the Packers need to win their last two. Probably the most notable event in this game was Brett Favre surpassing Dan Marino's record of 61,361 career passing yards. 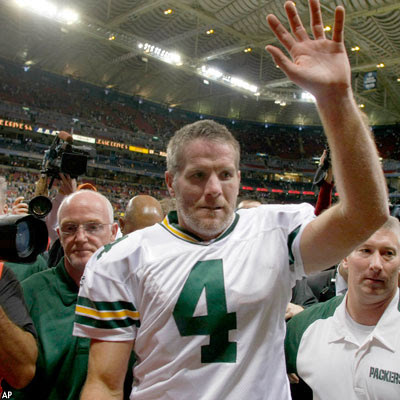 Favre now holds just about every record a quarterback can hold. Most consecutive starts by a quarterback (251), games won (160), career touchdown passes (440), pass attempts (8,715), pass completions (5,351), interceptions (438) and now passing yards (61,405). Pretty amazing. It's even more amazing when one considers he did all that while playing for a "small market" team. I doubt my Redskins will make the playoffs despite yesterday's win, so I'm rooting for the Pack to go all the way this year. This is also the first season he has had more than one really good receiver to throw to. Just imagine what he could have done if he'd had better receivers his entire career. "Another broken record" ... I'm sorry, my first interpretation of that was, "Oh, Ed is so self effacing, acknowledging that he's posting about the Packers yet again..."
Actually, I'm pretty boring. Really. I've been a musician for about thirty years. I play mostly fretless electric bass, although I have been dabbling with the fretted bass recently. I also mess around on other instruments. There are links below to the groups with which I am currently involved. I also plan to post some of my own music as I get around to recording it. Formerly a woodworker for a remodeling company, currently working in stringed instrument sales and repair. I'm married with two living daughters. I believe that you have to assume that those in power are conspiring to retain and increase their power at any expense. Remember, just because it's a conspiracy doesn't mean it can't be true! Ed Feeny "Impeach The Moron!" 40% Evil. Is that good?